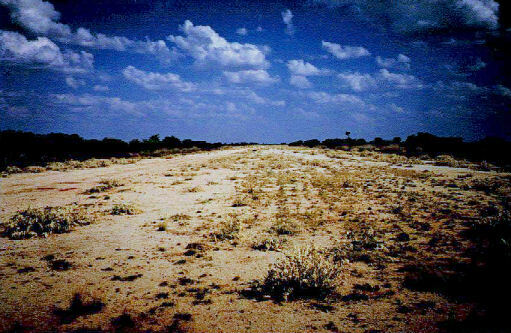 Corunna Downs was a secret airfield located in scrub and spinifex country, about 16 kms south west of Marble Bar in "The Pilbara" area of Western Australia. Today there are very few reminders of the once busy airfield. One can see some crumbling foundations and half filled post holes. 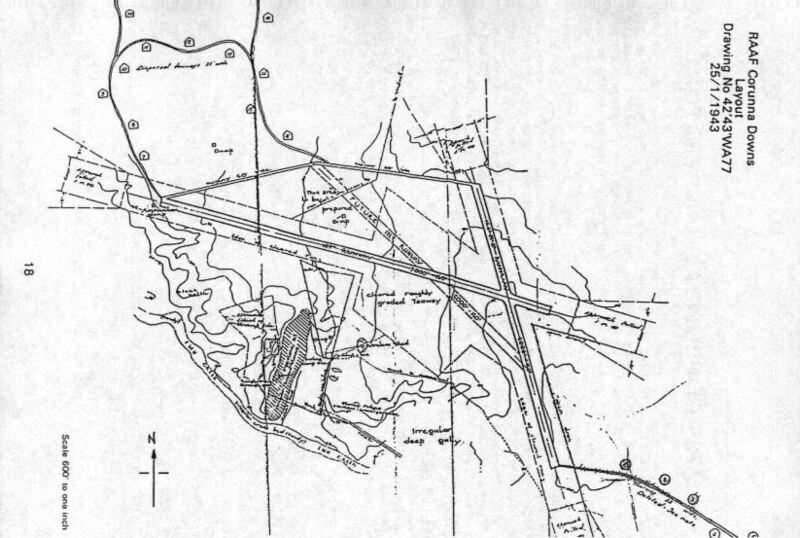 73 OBU operated the Corunna Downs airfield which comprised two intersecting bitumen runways. One ran approximately north-south, 5,000 feet in length while the other ran approximately east-west, 7,000 feet in length. Both runways were approximately 150 feet wide. A 50 foot wide taxiway linked the northern end of the north-south runway to the western end of the east-west runway. Approximately 20 camouflaged revetments to disperse aircraft to minimise bomb damage were constructed at Corunna Downs. 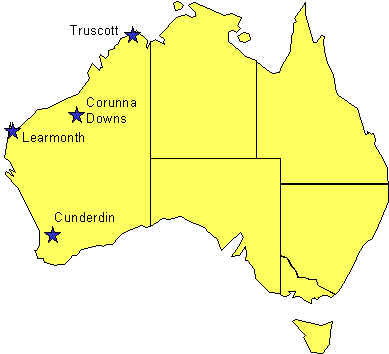 American and Australian Air Force units operated out of Corunna Downs airfield during WW2. They included 25 Squadron (City of Perth) RAAF and the 380th Bomb Group of the American 5th Air Force. They carried out numerous bombing raids on Japanese bases and shipping. Visitors who wish to look at the old Corunna Downs airfield no longer need to contact Corunna Downs Homestead. The site has been excised from the leasehold Pastoral Lease and is freely available to all who wish to visit. 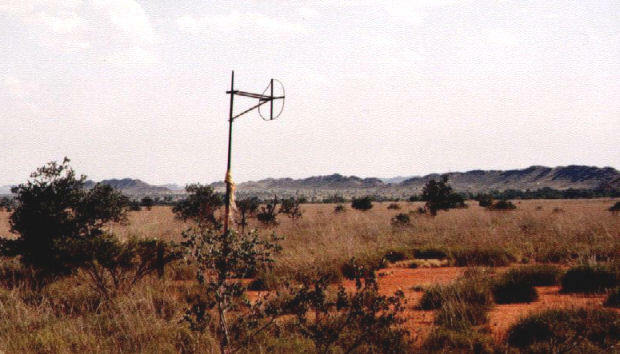 Robert Suttcliffe worked on Corunna Downs station for 7 years from 1974. While he was working there, he used to go out to the airfield quite a lot during that time. He was told a lot of stories about the wartime base there. He was told that there were 2,000 men and women stationed at the base. Robert told me in August 2000 about a plane that crashed there being rebuilt at the old base, during his years there. Robert and his mates also found 39 live bombs and Thompson sub machine guns that were buried in the area after the war finished. Robert told me that Corunna also had a prisoner of war camp located 6 miles north of the Corunna Downs station. Robert visited the airfield many times looking for mortar cases made of brass. "Corunna Downs - The Invisible WW2 Airfield"
"The Story of Corunna Downs - W.A. 's Secret WW2 Air Base"
I'd like to thank Derek Pont, Robert Suttcliffe and Sue Verschuer for their assistance with this web page.